So, Pat gave me a video camera for Christmas (yay!) I was able to play around with it some yesterday afternoon while I art journaled. Then I worked on learning how to edit, add music and text, and then upload the video. It was more of a process than I imagined, but I'm pleased as punch with myself. As such, I want to share the video with you. Here it is. I do plan on doing more videos with a variety of topics: jewelry, art journaling, other crafty endeavors, and whatever comes to mind. However, I know I need to up my game with the whole process. So, if you've got any tips, tricks, suggestions, or even ideas of what you want me to share, please don't hesitate to let me know! This is uncharted territory and I'm pretty excited to explore! Oh, and so that you can enlarge the photo, here's the finished product that you can click on for a larger image. I am SO happy you did this! Megan and I were wondering what your process was and how you made these really cool works of art. I don't have any technical tips for you as I am clueless on how to make videos, but I think you did a great job for your first one! I love how you used concrete mesh from the hardware store and the recipe card. Maybe you can do a video on materials, what you use and where you find them. So creative!!! I just love it! Can't wait to see more!!! Lorraine, Yay! I'm so glad you liked the video. I Megan did too, of course her art is way more impressive! I love using unusual elements in all of my crafty creations. I was thinking of doing a supply video or even a studio tour, but first I have to get the place in order. It's completely out of control at the moment. Thanks so much for checking it out and for the enthusiastic support! Absolutely appreciated! Great video Hope. You are a natural! I always like youtube videos where the person shows all steps sped up the way you did. The end result of your art journal is beautiful. Wow Hope it was great watching your creative mind at work. Thank you for sharing looking forward to watching more of your videos. Hi Hope! I feel like I just got to meet you in person and how fun is that!? 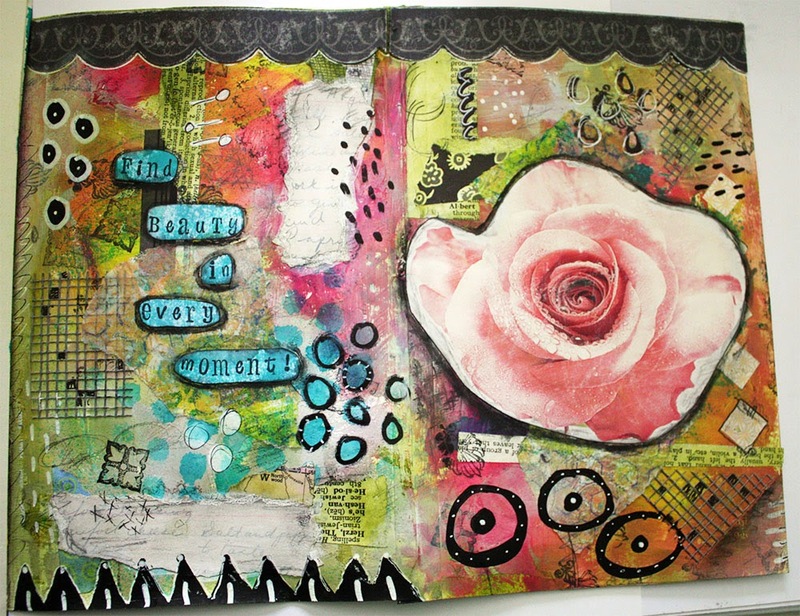 A couple years ago I took a course with "Brave Girls Club" and learned some art journaling and just love it. I wish I had more time (and space) to dedicate to it! Your entry is beautiful and it was fun to see you work through the process. Happy Holidays! I enjoyed watching your process! Always love watching other artists work. Very cool Hope, I loved seeing your process! I didn't realize how many layers and how much work was involved in your beautiful journal pages~ your eclectic choice of elements is fascinating, I have always wanted to get involved in collage...you have given me ideas and inspirations for 2015!